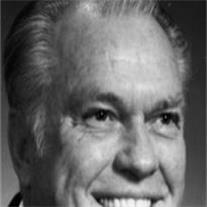 John Henry Tanner, 84, passed away peacefully at home on Monday, October 12, 2009. He was born December 6, 1924 in Joseph City, Arizona to Rollin C and Anna Harbrecht Tanner. From there he moved to California at the age of three. The family moved to Phoenix when he was 13 and John continued his education at North High. There he met his sweetheart, Bobbie Pratt. Soon after his graduation, he served in the United States Air Corps as a pilot, flying B-17s in World War II. His favorite missions were at the end of the war when he was able to drop food over Holland and pick up prisoners of war from France. Soon after his return from serving his country, he married Bobbie on February 8, 1946 in the Mesa Arizona Temple. They have enjoyed 63 wonderful years together. After their marriage, John attended UCLA and received his BS in civil engineering. In January of 1950 he began his career in the family construction business building roads, highways and bridges throughout Arizona. He became president of The Tanner Companies. John was a dedicated member of The Church of Jesus Christ of Latter-day Saints. He faithfully served in many capacities, including service in Stake Presidencies for 15 years under H. Burke Peterson and Reed E. Price, Regional Representative, Mission President of the Florida Tallahassee Mission, and President of the Mesa Arizona Temple. He is survived by his wife, Bobbie, his sister, Norma Butler, his children Linda (Steve) Allen, Norman (Judy) Tanner, Shari (Ralph) Larsen, Marilyn (Brad) Smith, and Ron (Leslie) Tanner. John and Bobbie have 28 grandchildren and 33 great-grandchildren. Funeral services will be Saturday, October 17, 2009 at 10:00 a.m. with viewing at 9:00 a.m. at The Church of Jesus Christ of Latter-day Saints, 1005 N. Voyager, Gilbert, AZ. Arrangements by Bunker’s Garden Chapel, Mesa, AZ.